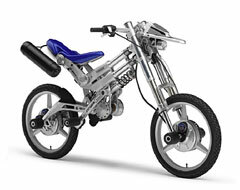 The Deinonychus, Yamaha's Prototype Electric Bike | OhGizmo! By David Ponce on 10/05/05 • Leave a comment! “Stretch & Shrink” functions in the vertical and horizontal directions that brings a very Yamaha joy of riding. In addition to the great driveability of the 2WD, it is possible to adjust not only the riding position but also the silhouette of the chassis to fit the rider’s body size, riding environment, road surface conditions and personal preference. And yeah, if you look close, those look like BMX pegs. Sounds like a bike even I’d like to own, although I’m not sure it’ll ever even see production. Read the full press release here. Story VIA The Raw Feed.